Vintage Purse a Day: Check out our new site! NEW! We are in the process of creating THE VINTAGE PURSE GALLERY, a virtual museum featuring photos of the incredible purses collected over two decades by author and speaker Wendy Dager. We are also offering a traveling exhibit of some these purses. If you are affiliated with a museum, gallery or other exhibition venue, please e-mail info(at)wendydager(dot)com for more information. If you would like to advertise on THE VINTAGE PURSE GALLERY, please e-mail info(at)wendydager(dot)com. 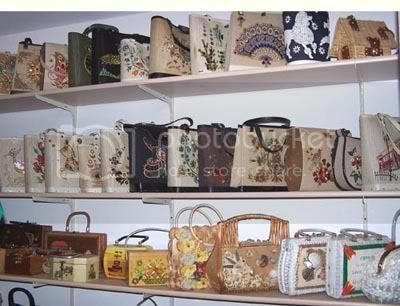 Vintage Purse a Day will remain on blogger and continue to be updated. Thank you so much for your patronage. We love our visitors and we love vintage purses!